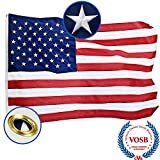 Silver Flag Pole: Best Tangle Free Spinning Flagpole on Amazon! Residential or Commercial 6ft Flag Pole. Free Shipping for Prime Members. 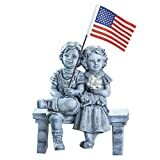 Aluminum Spinning Flag Pole (Silver) 6 Foot Brushed Aluminum. Wind Resistant / Rust Free. 1 Year No Hassle Warranty.
? 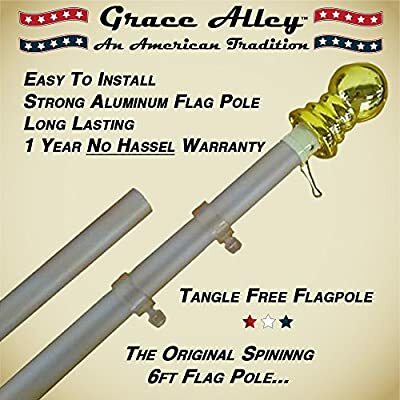 Best Tangle Free Flag Pole: When your new flag pole arrives you will immediately notice the "Free Spin Action" protecting your flag from being tangled or furled. This flag pole will extend the life of your flag and protect from tears.
? Multi Use Flag Pole: Designed to be used with 2.5' x 4' or 3' x 5' "sleeved" flags and 2.5' x 4' or 3' x 5' "Grommet" flags. 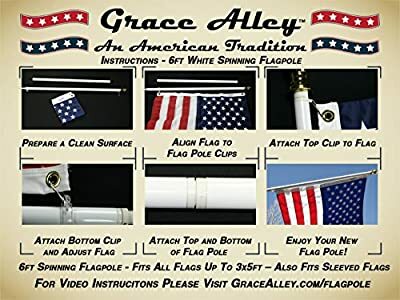 This multi-sized flag pole by Grace Alley makes it easy to get the right flagpole the first time.
? Rust Free / Wind Resistant: A flag pole that will with stand the outdoor elements. You will appreciate that your new flag pole is Rust Free, due to the "Brushed Aluminum" protecting your flag from rust spots. This flagpole was also developed to be extra Wind Resistant.
? 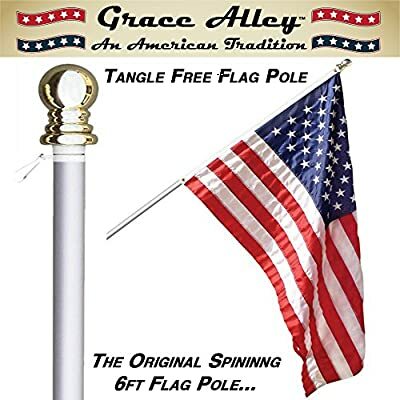 Guaranteed: Unlike other flag pole companies, we are Grace Alley and fully stand behind our products. If there is anything wrong with your new flag pole, PLEASE IMMEDIATELY CONTACT US! If you find a piece missing, we will send you a new one on the same day!
? Warranty: Your new flag pole comes with a 1 YEAR NO HASSLE WARRANTY! If the bearings stop spinning, you're covered. If a hurricane breaks your flagpole, you're covered! 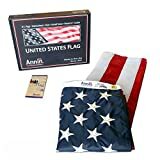 Your new flag pole ships from Amazon and comes with the Amazon A to Z Guarantee.
? 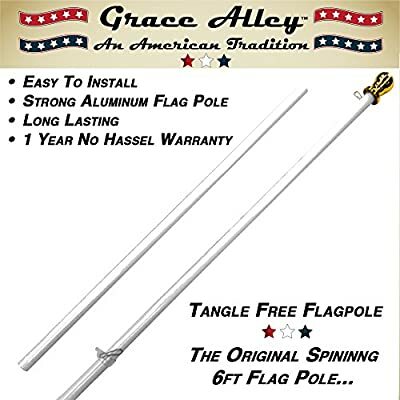 Best Tangle Free Flag Pole: When your new flag pole arrives you will immediately notice the "Free Spin Action" protecting your flag from being tangled or furled. This flag pole will extend the life of your flag and protect from tears. ? Multi Use Flag Pole: Designed to be used with 2.5' x 4' or 3' x 5' "Grommet" flags or 2.5' x 4' or 3' x 5' "sleeved" flags. 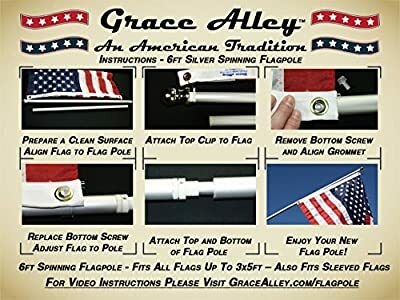 This multi sized flag pole by Grace Alley makes it easy to get the right flagpole the first time. ? Rust Free / Wind Resistant: A flag pole that will with stand the outdoor elements. You will appriciate that your new flag pole is Rust Free, due to the "Brushed Aluminum" protecting your flag from rust spots. This flagpole was also developed to be extra Wind Resistant. ? 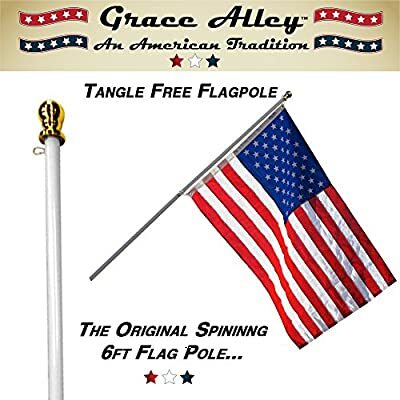 Guaranteed: Unlike other flag pole companies, we are Grace Alley and fully stand behind our products. If there is anything wrong with your new flag pole, PLEASE IMMIDIATELY CONTACT US! If you find a piece missing, we will send you a new one on the same day! ? Warranty: Your new flag pole comes with a 1 YEAR NO HASSEL WARRANTY! If the bearings stop spinning, you're covered. If a hurricane breaks your flagpole, you're covered! Your new flag pole ships from Amazon and comes with the Amazon A to Z Guarantee.